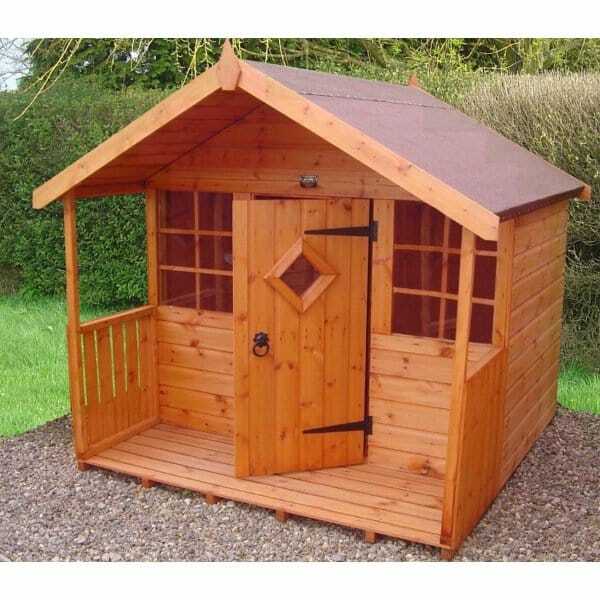 A1 Garden Playhouse: The A1 Garden Playhouse is a lovely playhouse which is perfect for fitting into smaller gardens whilst still providing a stimulating place for children to play. This playhouse features beautifully finished, smooth planed timber which will ensure there are no rough edges exposed. The single front door also have finger saving safety strips so there's no risk of fingers getting caught and the two front fixed windows are fitted with styrene. The optional veranda is available for Size B and Size C of the playhouses, giving this playhouse a truly traditional and welcoming look and feel. The roof is finished with included green mineral felt to provide protection against the elements. A truly lovely little playhouse to be enjoyed for many years. The Playhouse B & C Sizes INCLUDE The 2ft Veranda: Making Playhouse B Floor: 4ft x 6ft and Playhouse C Floor 6ft x 6ft.